In Gerard Arthur Eccles v HMRC  TC6978, the first tier tribunal held that tax relief for a payment under a personal guarantee may only be made in the tax year in which it was paid. The taxpayer guaranteed a company's bank borrowing. The company's deal failed and the bank called in the guarantee. The payment was made on 26 March 2012. The taxpayer wished to claim the loss relief for CGT under the s253 TCGA 1992, the Loans to Traders rules. He claimed the loss arose in an earlier tax year, to offset a capital gain in tax years 2009/10 and 2010/11. 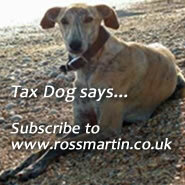 HMRC disallowed the claim for both years. The loss arose sooner because the bank could or should have called in the guarantee sooner. Alternatively, the loss arose in 2009/10 because that is when the bank declined to extend funds to develop the site. The tribunal disagreed: an allowable loss accrues “when the payment is made”. The law was clear that the loss arose when the payment was made. If a UK resident individual or company makes a loan to another taxpayer and it becomes irrecoverable, capital loss relief may be available under s253 TCGA 1992 (relief for loans to traders).